Marfa, the county seat of Presidio County, is sixty miles north of the Mexican border, 200 miles east of El Paso, and 200 miles west of Midland. Although small, it has become an international art and cultural center due to the presence of the Chinati Foundation, the Judd Foundation, the Lannan Foundation, and Ballroom Marfa, which host artist- and writer-in-residence programs here. The town is surrounded by large working ranches. The population, which is 61 percent Hispanic, is a mixture of ranchers and cowboys, construction workers, retirees, young artists and writers, and part-time residents from Houston, New York, California, Europe, and elsewhere. Many of the Hispanic families have been here since the early 1900s; others are recent arrivals from Mexico. It is an exciting and challenging place to live. Marfa is exciting because it is a town in transition. It was founded in 1883 as a shipping point on the Southern Pacific Railroad, and until the 1970s was primarily a cattle town, with its economy subject to the fluctuations of the weather and the cattle market. A military post, Fort D.A. Russell, provided some economic stability between 1912 and the end of World War II. In 1973 a New York artist, Donald Judd, moved to Marfa and subsequently bought the old military post, making Marfa the center of the international Minimalist art movement. Since Judd’s death in 1993 and the establishment of two foundations to perpetuate his legacy, a new population of cosmopolitan young families has been drawn to Marfa. They have opened art galleries, performance venues, restaurants, a gourmet grocery store, and a superb book store, and have founded a community-owned National Public Radio station. The demographics of the town have shifted dramatically in the past two decades and many new opportunities have developed. 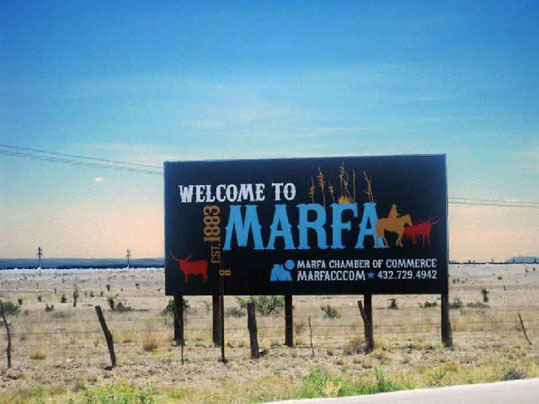 Many years ago a rancher told one of our vicars who was bemoaning the small size of his congregation, “This country will only support so many cattle, and those cattle will only support so many people, and only a very small percentage of those people are ever going to be Episcopalians.” That is changing, and that is what makes Marfa exciting. Marfa is challenging because of its isolation. It requires a special kind of person to live here. It is 200 miles to the nearest airport and 90 miles to the nearest WalMart. It is in the high desert, with an average rainfall of 15.8 inches a year. Marfa also has unaddressed social problems. Social services are underfunded and there are few employment opportunities for the unskilled. The unemployment rate is 15.5 percent while the statewide rate is 8.1 percent. 23.6 percent of the people in Marfa live below the Federal poverty level, as opposed to an average of 17.2 percent for the entire state of Texas. There is an adequate but certainly not outstanding public school system and a Montessori school for children 3 to 6. There are two health clinics and several excellent doctors. Some of the challenges of living in Marfa are alleviated by the fact that it is only 24 miles, a twenty-minute drive, from Alpine, a city of 6,000 that is the home of a state university and a regional hospital, as well as services that are not found in Marfa, such as a dry cleaner, a pharmacy, and a movie theatre. Most Marfa residents make at least one trip a week to Alpine. The smaller town of Fort Davis (population 1160) is also twenty minutes away. Employment opportunities in public administration, education, law enforcement, and tourism can be found within a thirty-mile radius of Marfa. Marfa offers many attractions for those who enjoy the outdoors. Big Bend National Park and the adjacent Big Bend Ranch State Park, 60 miles south, comprise more than a million acres of rugged volcanic mountain and mesa country, bounded on the south by the Rio Grande. The smaller Davis Mountains State Park is 25 miles north, as are Fort Davis National Historic Site, a cavalry post dating from the 1860s and once manned by African American Buffalo Soldiers, and the University of Texas’s McDonald Observatory. The surrounding country is spacious, with the Chinati Mountains on the southern horizon. Due to a light abatement policy encouraged by the Observatory, the night sky is filled with stars and attracts amateur and professional astronomers from all over the world. The climate is moderate year-round, with an average high temperature of 91 in June, an average low of 24 in January, and clear skies all year. Many people describe Marfa as a paradise; to others, it is a difficult place to make a living. But few people who live here would voluntarily leave.